1. Roughly chop potato, carrot, and onion. 2. Place in saucepan with boiling water and cook for 10 minutes (or until soft). Spoon out boiled vegetables, set aside in separate bowl and keep the vegetable cooking water for cheese sauce. 3. Place all ingredients for the cheese sauce into blender and blitz until smooth. 4. Cook the pasta in boiling water. Once cooked, drain and transfer to serving dish. 5. 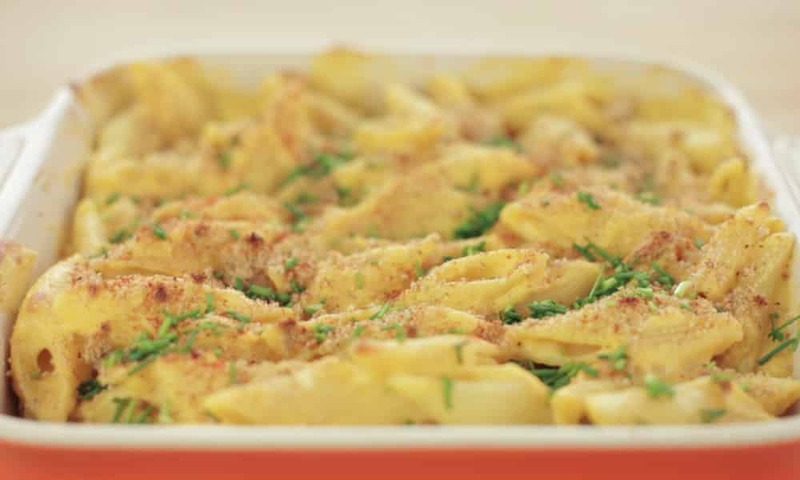 Mix the cheese sauce with the pasta and sprinkle with breadcrumbs. 6. Grill for 10 minutes. 7. Top with paprika and chives, then serve. I enjoy your recipes. especially the taco ring. great for a party and looks different.